“Mom, there’s a porcupette in your herb garden,” our son Mark said. I hurried out to see it. The little creature was tucked in against our brick chimney and flapped its tiny tail when I put my hand near it. Apparently, it had climbed up the slope from the overgrown flat area below. The porcupette seemed young to be out and about on its own, especially in midday, because there was no sign of a mother porcupine. Still, we knew of at least one adult porcupine living under the guesthouse and spending its daylight hours high in a large white pine tree a few hundred feet along our access road. I wondered if the porcupette was hungry and put some lettuce leaves close by for it, but the youngster remained huddled against the chimney for several hours and never touched the food. 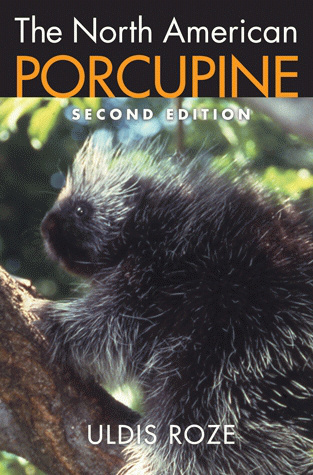 I had not seen a young porcupine before and could not judge how old the porcupette was. Even though it was April 9, we had had another cold blast from the Arctic, and since my herb garden was on the south side of the house, the porcupette may have wanted warmth instead of food. The following day there were two fresh inches of snow on the ground. Once again the porcupette appeared near midday and huddled against the chimney for the rest of the day. But late in the afternoon, an adult porcupine waddled up the slope and, when I went outside to look, she climbed a black walnut tree near the chimney. She never went near the pup, but I assumed she was the mother. According to Uldis Roze, who wrote The North American Porcupine, often mother porcupines don’t defend their offspring. Furthermore, Roze claims that usually, during its first six weeks of life, a porcupette is too weak to travel long distances with its mother. She stays near her offspring by day, sleeping in a tree, while the youngster remains hidden in a ground den or in the hollow base of a tree. Then at night the mother comes to her pup to nurse it. At birth a porcupette is well-developed and weighs about a pound. It is completely covered with black fur and quills, the latter stiffening in an hour. Our porcupette looked a little larger than one pound but, as usual with wild animals, I chose not to interfere with it by attempting to weigh it. Also I knew that its tail of quills was fully functional. However, if the porcupette was older than six weeks, that meant it had been born in mid-February. This seemed unlikely since a female porcupine is pregnant for seven months, which would mean she had been bred in mid-July instead of the usual mid-October to mid-November breeding period of Pennsylvania porcupines. Even if she had bred as early as mid-September, her youngster would have been as young as a week when we first saw it. Maybe, like human babies, the porcupette had mixed up its days and nights. Whatever the case, it looked as if neither mother nor baby had followed the usual porcupine playbook. A female porcupine mates once a year during an 8-to-12-hour period, but the lead up to it is fraught with screams even if she is sitting next to a prospective mate on a tree branch who has been lured there by following a vaginal mucus mixed with urine odor she has emitted. During one porcupine courtship Roze witnessed near sunset in New York’s Catskill Mountains, the female retreated, turned her back and slapped him with her tail. He retreated and she sat facing him while still on the branch. She then began eating a twig she had snapped off. Again, he approached her and she kept feeding. She squawked at him and he retreated once more. He tried to touch her gently and she turned around and screamed. He backed off and tried to approach her as he made a chuckling sound, but she continued eating. Finally, they ate quietly side by side until it was too dark for Roze to see any more. That “half-revelation” was experienced by Kurt Engstrom on October 6, 2006, during archery deer season on SGL#176 near State College. Kurt is a friend of ours who keeps a detailed journal of all his hunting experiences. He was in his deer stand in the early morning and beginning at 8:00 a.m. intermittently until 10:00 a.m. he heard “moaning and chirping coming from the ridge, maybe 80 yards away. Finally, at 10:15 a.m., I had to go find what was making the noise. Approaching the noise, I found a large porcupine on the ground and then [saw] the second one about 7 feet off the ground in a small tree growing at a 45 degree angle out of the ground. The one in the tree [was] smaller and turned facing down the trunk at the one on the ground.” Female porcupines are smaller than the males and she was the one making all the noise that Engstrom had heard. At that point, he gave up hunting for the day. Had he stayed around he might have seen what a few researchers have–the actual mating of the two prickly creatures. It happens on the ground after he has thoroughly wet her down with his urine. She may shake herself and retreat if she’s still not ready or she may acquiesce if she is. She raises her hind quarters and curves her tail back over her quill rosette which allows him to briefly mount her and mate. Between rest periods they repeat this sequence until either one tires, climbs a tree, screams at its mate, and ends their mating phase. He goes off and she is on her own as a single mother-to-be. Although her pregnancy lasts seven months, during the winter she conserves her energy by spending most of her time in a den. The fetus remains small, but during the last month of pregnancy, when spring food of tender new leaves is available, the fetus doubles in size before it is born, usually in May or June. Whatever the age of our porcupette, it appeared around noon on April 12 and clambered through our old discarded Christmas tree lying on its side near our bird-feeding area, and then it climbed a black walnut tree sapling. It went nearly to the top, gnawed a little on the bark, and headed back down, rear end first and front legs clinging to the tree trunk as it slowly descended to the ground. It walked over to a pile of ash logs and disappeared at 1:00 p.m.
Later that day, near five in the afternoon, I glanced out the kitchen window and saw it sitting in a branch sticking out near the top of a large split black locust tree that had fallen over the previous year. The following day the porcupette was out on the back slope by 7:15 a.m. eating grass. Then it walked back to the broken-off black locust tree and climbed up to the new, young sapling growing out of it. I could see where it had gnawed off small patches of bark. It did more gnawing and climbed carefully down and then up again as if it was practicing its climbing skills. Near dusk we saw the porcupette down slope near the ash branches eating grass for dinner at 7:00 p.m.
At last, on April 14 it was warm and clear. I spotted the porcupette in the juniper tree in my herb garden and had a perfect view of it from the stairway window. I watched as it figured out how to climb down through the maze of prickly branches and trunk which was more complex than the simple black locust it had climbed the previous day. It even tried to go head first but quickly reversed itself and used its sharp claws to cling to the woody surface as it went down bottom first. Once it regained the ground it trundled down slope to the broken-off locust tree and disappeared into its hollow trunk. That was the last we saw it. We hoped it had joined its mother in the woods, spent the summer with her, and gained its independence when its mother entered her breeding phase. Both had taught us that even animals as common as porcupines have much to teach us about their lives. My mother-in-law was a cat lady. Born and raised on a farm in northeastern Pennsylvania in the early 20th century, she, like most rural residents, then and now, knew the value of “barn cats”—free-ranging cats fed by farmers in exchange for the cats dispatching the rats and mice attracted to food they grew and stored. On 25 rural acres in central New Jersey where my husband, Bruce, grew up, his mother fed 30 or more “stray” cats every evening. They also owned a pet indoor cat that had been spayed, received veterinarian care and the proper vaccinations, and never left the house. I had not grown up with pets and was more interested in native birds and animals. But when we moved to Pennsylvania in 1971, we became reluctant owners of stray cats that folks dropped off at the bottom of our mountain. Our boys found kittens in our barn, and suddenly we had four adorable kittens to care for. In addition, a frequent visitor from New York City gifted us with mature cats she had found roaming free. Although we tried, the kittens refused to be house-trained, and I put them all outside. I continued to feed them, but one by one they disappeared. They were always replaced with more cats that migrated up our road. Finally, I started catching and taking them to the local Humane Society. After a couple trips, we were scolded for not getting them spayed and being responsible pet owners. I explained that we hadn’t asked for these animals, and I had no intention of becoming a cat lady like my mother-in-law. I loved birds, and while I rarely saw any kills from these free-ranging cats, I knew that they preyed on wildlife. Eventually, I refused to feed any more cats. It was a difficult decision because they are beguiling creatures. And I was angry with the folks who dropped these unwanted pets out in the woods, thinking they could live on the wildlife. Today I rarely see a cat on our mountain because eastern coyotes prey on them. But when we drive in rural valleys we often see cats hunting on the fields or killed on the roads. Many of these cats are feral or tame strays that don’t belong to anyone. Others are household pets allowed to roam outdoors. Since the 1990s, more and more people—rural, suburban, and urban—own cats. In the United States there are as many as 80 to 90 million owned cats. Of these 60 to 70 percent go outside. In addition, scientists have estimated there are also 30 to 80 million ownerless cats that freely roam outdoors. One scientist, Stan Temple, set off a fire storm back in 1993 when he published a paper in the Wildlife Society Bulletin claiming that his research on farms in Wisconsin’s dairy lands found that cats were killing as many as 7.8 million birds yearly in the state and that a minimum of 10 percent of small-to-medium birds in a cat’s range were preyed on. Temple was concerned about the USDA’s Conservation Reserve Program that paid farmers to replace erodible croplands with permanent grass cover in an effort to help the dwindling number of grassland bird species such as bobolinks, Henslow’s sparrows, and eastern meadowlarks. Those grasslands contained dozens of barn cats as well as free-ranging pets preying on the birds the program had been designed to help. Domestic cats, scientists pointed out, are not native cats but have evolved from the Near Eastern wildcat (Felis silvestris lybica) and have been spread worldwide by humans, arriving in North America before Columbus’s second voyage (1493-95). Domestic cats were even eaten by starving colonists at the Jamestown colony in the early 1600s. Cats are not the only reason that one-third of bird species (233) in the United States have declined significantly since around 1970. Grassland bird species, for instance, have been most impacted by habitat loss and pesticide use in addition to cat predation. And Temple’s study was the first of dozens more that examined the impact of non-native cats on our native birds, although he received the most vitriolic hate mail and death threats and was accused of hating cats, even though he owns an indoor cat like many of the researchers who have studied the problem. In 2013 a paper in the scientific journal Nature Communications, authored by Peter Marra, Director of the Smithsonian Migratory Bird Center, and his associates, estimated that cats killed 1.3 billion to four billion birds per year in addition to small mammals, reptiles and amphibians. Specifically, each free-ranging cat annually killed an average of 30 to 47.6 birds, 1.9-4.7 amphibians, 4.2-12.4 reptiles and 177.3-299.5 mammals including native mice, shrews, voles, squirrels and rabbits. As a wildlife person, I was appalled. But the majority of people in our country are now urban and suburban inhabitants and their association with animals is with their pets—mostly dogs and cats. But dogs must be licensed and cared for and are completely dependent on their owners for food and exercise outdoors on a leash. Those owners must even dispose of their waste in a responsible way. That’s not true for cats in many parts of our country. Pennsylvania’s own Department of Health as well as the federal government’s Centers for Disease Control and Prevention consider rabid cats to be a serious public health concern. Dogs used to be but since stray dogs are controlled here and owner dogs vaccinated, free-ranging cats, fed by well-meaning, compassionate people who love them, are often joined by raccoons at their feeding sites. Raccoons, since the 1950s, have been the main vector for rabies in the eastern United States but from 1982-2014 there were 1,078 laboratory-confirmed cases of rabies in outdoor domesticated cats in Pennsylvania. Nationwide, by 2013, 53 percent of all rabies from domesticated animals were cat-caused and only 19 percent from dogs. Cats need several vaccinations over the years to keep them rabies-free, which is possible only if cats are owned and taken regularly to a veterinarian. Admittedly, contracting rabies from either a wild or domesticated animal is a rare occurrence in our country. But Toxoplasma gondii, a parasite that is often transmitted through cat urine and poop, sickens as many as 22 percent of the United States population. Toxoplasmosis used to be thought fairly innocuous, but studies by neurologists have linked it to blindness and a large array of mental illnesses in some infected people. Most likely this “Zombie Maker,” as Peter Marra and Chris Santella call it in their eye-opening book Cat Wars: The Devastating Consequences of a Cuddly Killer, changes the brain chemistry in humans as it does in rats and other animals. One study in the United States found that those with toxoplasmosis were 2.7 times more likely to develop schizophrenia later in life, especially if, as children, they had had close contact with cats. Severe depression, bipolar disorder and obsessive-compulsive disorders may also be caused by the disease. In addition, a study in 20 European countries seemed to prove that suicide rates in older postmenopausal women were positively related to the disease. Frankly, after reading the chapter on toxoplasmosis I was horrified that I had ever allowed our sons to play with stray cats. Because the parasite gets into public and private water systems through cat urine and feces, it is also infecting a wide array of marine animals, wild birds, and other animals. Ongoing studies seek to find out exactly how dangerous toxoplasmosis is to them. Cats also contract feline leukemia which can spread to bobcats and cougars if they prey on free-ranging cats as I am sure our bobcats do. Cat-lovers continue to question the findings of scientists regarding the number of cats roaming outdoors and the damage they do to wildlife because current estimates are based on extrapolations from many small-scaled studies. Still, given the current research, it seems that for the health of cats, their owners, and wildlife, keeping cats indoors is better for all. Other pet owners, including Stan Temple, have built cat enclosures, now dubbed “cat patios” or “catios” so they can enjoy the outdoors without endangering birds and other wildlife. They can also take agreeable cats for walks on a leash. It was near the beginning of the Pennsylvania Game Commission’s reintroduction of fishers to the commonwealth. This second largest member of the weasel family had last been documented in Pennsylvania when it was trapped in 1921 at Holtwood, in Lancaster County. Denise Mitcheltree, then a graduate student at Penn State back in May of 1995, took me with her to the Quehanna Wild Area and the Sproul State Forest, where she was searching for the first radio-tagged fishers released in late 1994. Mitcheltree was working under the tutelage of Dr. Tom Serfass, who had previously been the prime force behind the reintroduction of river otters to Pennsylvania. Both of them believed that weekly, long distance radio-monitoring without disturbing the fishers would allow them to learn more about their preferred habitat, dispersal, and prey species. Most of the fisher research they were depending on had been done by scientists working in the largely coniferous and mixed deciduous forests of Maine and Michigan’s Upper Peninsula where remnant fisher populations remained after habitat loss and over-harvesting had extirpated them not only in Pennsylvania but farther south in the Appalachian Mountains. Fishers, Mitcheltree told me, were known to avoid water so the West Branch of the Susquehanna River was supposed to be a barrier for them, but already three fishers had crossed the river. Furthermore, since the scientific literature stated that fishers needed coniferous and mixed forest with a heavy canopy to provide better protection from winter weather, fisher releases were only to occur in Pennsylvania’s north woods. Mitcheltree objected to information claiming fishers were ferocious animals. She insisted they were shy, secretive creatures that avoided any contact with humans, which was why she was surprised that some of the fishers she was following were moving through the back yards of the cabins and, in some cases, isolated occupied homes. A lot has changed since then. Even its genus. Formerly, it was Martes, the same as that of the marten. But DNA studies in 2008 found that although both descended from a common ancestor, the fisher was distinct enough for its own genera Pekania, based on its alternate name pekan. Its species name remains pennanti for Thomas Pennant who called it a fisher back in 1771. Larkin, his graduate students, and Matt Lovallo, Mammals Coordinator for the Pennsylvania Game Commission, have published three recent papers on fishers in Pennsylvania, and all of them reflect changing ideas about the lives of central Appalachian fishers. The first paper studied the selection of rest sites by fishers in the eastern deciduous forest, specifically in south-central Pennsylvania in and around state game lands 26, Gallitzin State Forest, and adjacent private lands. They captured and radio-collared 23 fishers that used 79 resting structures. The most common (65%) were in live black cherry, American beech and sugar maple trees with broken tops or cavities. The second most used (17%) were in standing dead trees with cavities or broken tops. Finally, 14 percent utilized ground-level structures such as burrows, rock piles, and root balls. The forest surrounding the resting structures had floors of coarse woody debris and rocky ground cover, a complex canopy, and more diverse tree species. However, the rest sites were mostly in pure deciduous stands (74%), followed by 21 percent in mixed stands and none in coniferous stands. In selecting rest sites, canopy cover was not that important and they rested in stands with a wide range of canopy covers. A second study in three distinct regions of Pennsylvania—northern (Allegheny), central (Quehanna), and southern (Blue Knob)—consisted of mostly deciduous forest and sought “to examine the influence of landscape characteristics on patch use by fishers in the predominately deciduous forests of the Appalachian Mountains in Pennsylvania,” according to their 2017 paper published in the Journal of Fish and Wildlife Management. Surprisingly, they found that fishers used low-density residential areas and could tolerate some kinds of land development, especially if they harbored favorite prey such as squirrels and chipmunks and some forest cover. Few roads might also favor fisher use, but that was not as clear cut. So far, studies have not been done in heavily suburban areas in Pennsylvania, but research on GPS collared fishers by Roland Kays and Scott LaPoint near Albany, New York has found that fishers use small drainage culverts to cross highways and move from one fragmented forest habitat to another. One of their fishers hunted in larger patches of forests and then moved along narrow forested strips to get between patches. Rabbits and squirrels were their favorite foods. A fisher they named Phineas crossed on/off ramps to hunt in the forest of a highway cloverleaf interchange. When Kays tracked him in the snow he discovered that Phineas dug in the snow after mice, ran up trees pursuing squirrels, and tunneled down into a cattail marsh after either rabbits or muskrats. Other fishers they studied were similarly unfazed by development. One cut through the yards of subdivisions and spent the night in a pile of junk in the woods and another hunted in patches of woods between golf fairways. A female was able to survive in a kilometer of suburban forest and a male killed on an interstate in Schenectady had traveled over 205 miles in one month, crossing dozens of roads before leaving the countryside and returning to urban forests where he crossed his last road. Kays hypothesized that he was searching for his own territory. Most, though, were in search of food. A third study by Larkin, Lovallo, and graduate students looked at the diet of central Appalachian fishers in 30 counties in Pennsylvania which showed how diverse the food of fishers can be. From 2002 to 2014, they examined the stomachs of 91 road-killed, incidental trapper-killed, and legally harvested fishers using microscopic hair inspection and macroscopic examining of bones, teeth, claws and other hard parts. They discovered remains of deer (12), rabbits (11), porcupines (10), voles, woodrats, and mice (21), woodchucks (4), eastern gray squirrels (8), eastern chipmunks (3), red squirrels (3), coyotes (2), red foxes (3), raccoons (6) and opossums (8), as well as one each of ring-necked pheasant, black-capped chickadee, downy woodpecker, black rat snake, frog, and brown prionid beetle, and two bony fish. They also ate a variety of plant materials. Incidentally, there was no sign of domestic cats in their study nor in a separate study Kays did in New York State. Both Kays and Larkin believe that coyotes are the culprit cat killers. 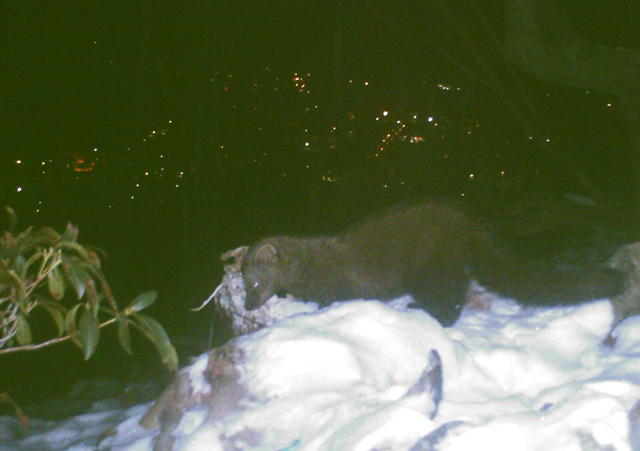 Central Appalachian fishers are finding so much prey and so few predators that they are spreading quickly in areas where they disappeared from centuries ago, such as in New York City, where the first known fisher, since shortly after Manhattan was settled, was photographed in June of 2014. It was 5:30 p.m. on a balmy day in early March and my son Dave and I were fixing dinner in the kitchen. I rushed to the window, grabbed my binoculars, and called my husband Bruce to come and see the unusual eastern gray squirrel. In the meantime, the squirrel had climbed up the back slope and we thought it would come to our bird feeder area below our porch steps. Instead, it veered over to the far edge of my backyard herb garden beside the feeders and ran off. A few minutes later Bruce spotted it below the slope near our old springhouse before it disappeared. During our 46 years on our mountain we had never seen a black gray squirrel, although I knew there was a population on the Penn State Altoona campus at the base of the Allegheny Front. And later, our caretaker Troy told us he had never seen any black squirrels on our Brush Mountain, the westernmost ridge in the Ridge-and-Valley Province, but he added that there was a population in a small village at the base of our mountain on the Logan Valley side. The next time I saw the black squirrel, spring had officially arrived even though it was 17 degrees and the ground had frozen hard again. I stepped outside in the early morning and glimpsed the squirrel at the bottom of a backyard black walnut tree. Spotting me, it ran downslope to the flat area and up into the woods on Laurel Ridge. On April 3, I again glimpsed the black squirrel in the flat area at 7:30 a.m. A gray squirrel, one of the army of 10 raiding our feeders every day, chased it back up into the woods. Two days later, after returning from my morning walk, I stopped to admire the blooming hyacinths and daffodils in our backyard. That’s when I noticed the black squirrel crossing the flat area. I watched it through my binoculars while it searched for food beneath the leaf cover at the edge of the woods, and paused a couple times to scratch itself. Once a gray squirrel approached but did not chase it. Nevertheless, the black squirrel retreated but continued foraging. Next it climbed on to fallen trees, using them as runways. Once it sat up on its hindquarters and I saw that it had an orange underbelly. Then it continued slowly on its trek over to the springhouse and wetland where I lost sight of it among the cattails. Although I continued looking for it throughout the following months, I never saw it again. I figured that a predator had caught it or that it had been visiting and had moved on. But last November one of our archery hunters saw it still living nearby. Scientific descriptions aside, black gray squirrels are more common farther north while gray squirrels dominate southern areas in the eastern United States and Canada. Some researchers believe that before Europeans arrived in North America, black gray squirrels were predominant throughout eastern North America because forests were old and thick and provided better cover for that color phase. But once the forests were cut, they hypothesize, gray squirrels became the dominant type throughout their range. Another, earlier study in Canada in 1978, where black gray squirrels dominate, found that they had “significantly lower heat loss” than gray squirrels during the winter which they thought explained why black gray squirrels were common where winters were colder and there was a constant snow cover despite the fact that a black coat would not provide camouflage for them in a white world. 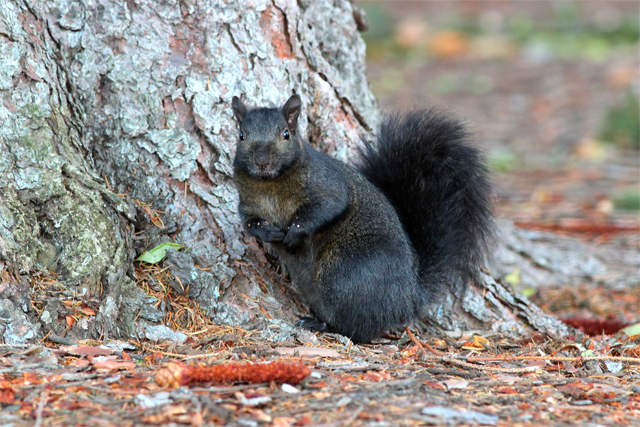 Native black gray squirrels live in Ontario and Quebec and northern Michigan, Wisconsin, Minnesota and Pennsylvania. But there have been so many releases of these squirrels both in the United States and England, usually courtesy of Ontario, that it is difficult to sort the naturally occurring from the released ones. In Britain they were released at the end of the 19th century and 18 from Canada arrived at the National Zoo during Teddy Roosevelt’s presidency. Canada also sent 10 to Kent, Ohio in 1961. Strangest of all is the so-called “Home of the Black Squirrels” out in the plains in Marysville, Kansas. Supposedly the squirrels escaped from a traveling circus or maybe a gypsy encampment in the late 1920s. Marysville even holds an annual Black Squirrel Celebration. The black squirrels in Washington, D.C. have spread over the city, and they’ve done the same in other towns and cities where they were released. Apparently, they are safer from their predators, which are primarily birds of prey. And squirrel hunters, eager to bag a black gray squirrel, cannot shoot them in such places. I checked a couple online sources regarding black gray squirrels in Pennsylvania and compiled a list of cities and towns where black squirrels live such as Fairmont Park in Philadelphia, the Haverford College campus, which has so many that they’ve adopted Black Squirrels as their sports mascot, and the eastern suburbs of Pittsburgh. A.D. Plummer, who says he hunts and fishes every day in central Pennsylvania, according to the Answers section of the Field and Stream website, claimed he had never seen a black squirrel there until 2009 when he saw two in two places 30 miles apart. 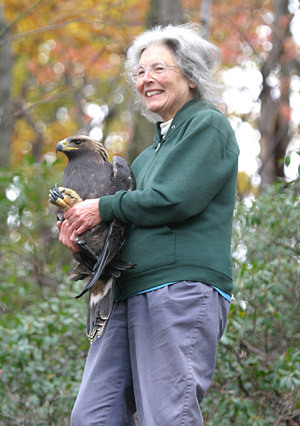 M.J. Frazier in 2012 reported from western Pennsylvania that a small colony nested in their neighborhood and liked bird seeds but stayed away from the gray squirrels. Well, not quite everywhere. On the HuntingPA.com website in answer to a hunter’s question about where he can find black squirrels, it looks as if the largest numbers still live in the wild across the northern tier of the commonwealth. One hunter found black squirrels scattered in five different locations over four counties—Lycoming, Clinton, Potter and Tioga. Another reported three blacks to one gray in Cook Forest, Clarion County, adding that one day he counted five different black squirrels. Several were seen near Dubois in Clearfield County and a couple hunters claimed they were common near Kinzua Dam in the Allegheny National Forest. Two hunters mentioned Pike County in northeastern Pennsylvania, and another Brookville in Jefferson County near Treasure Lake. Whether all these squirrels were coal black, brown-black, or both is not clear except for those reported by M.J. Frazier, but S. Testy does question articles that say only one gray squirrel in 10,000 is black and suspects, at least here in Pennsylvania, that that is a low estimate.